Though Cinnamon comes with a settings tool you can not yet customize it to the fullest. This is because it still is under heavy development and it is even not yet recommended to create super-creative themes, since it is likely that functions will be altered or added in the near future. Nevertheless I have searched the cinnamon.css file (the file that is responsible for most stylistic issues of cinnamon) of the current version 1.3.1 for the classes that have to be altered to change the basic interface elements, the panel and the menu. The file you need is /usr/share/cinnamon/theme/cinnamon.css. Color values are given in hexadecimal codes (e.g. #FF0000) or in RGB values plus transparency (e.g. (255,255,255,0.5). A color can easily be converted to the other format using graphical software such as Pinta - just use the software's color picker to choose a color and then copy and paste the code, or insert a code to get the other. If two colors are given in the form of a gradient, there is a color flow between the two given colors. Note2: Changes only apply after restarting Cinnamon. To change the panel's color, search the file for the #panel class and change the background-color value. To change the unfocused panel buttons' colors, search the file fo the .window-list-item-box class and edit the background-gradient-start and background-gradient-end values. Start marks the button's top where end marks the button's bottom. To change the focused panel buttons' colors, search the file fo the .window-list-item-box:focus class and edit the background-gradient-start and background-gradient-end values. Start marks the button's top where end marks the button's bottom. To change the button border color of the two above possibilities, change the box-shadow value in the same classes. To change the border color of the two above possibilities, change the box-shadow value in the same classes. To change the favorites menu's background color, search for the .menu-favorites-box class and edit the background-gradient-start and background-gradient-end values. To change the favorites menu's selection box color, search for the .menu-favorites-button:hover class and edit the background-gradient-start and background-gradient-end values. To change the menu's texts, there is usually a value called color inside the appropriate classes which handle the text color. Also, the other possibilities can easily be identified by the classes' and values' names. How does one modify the appearance of the basic dialog box elements. I want to increase contrast among various on screen items. For example, I’d like to enhance the distinction between the default selected button and the other buttons in most dialog boxes. I’d also like to alter the distinction between the scroll slider itself and the tray the slider rides in. I remember a control that use to permit me to touch a dialog widget then adjust colors, shading, size and other details. I don’t find that dialog in recent desktop controls. Hi. I’ve been trying to duplicate your work. I was wondering if you have the CSS file you used to create the desktop colors I see in the screenshot. You chose your colors really well and I would love to use the same. Thanks in advance. 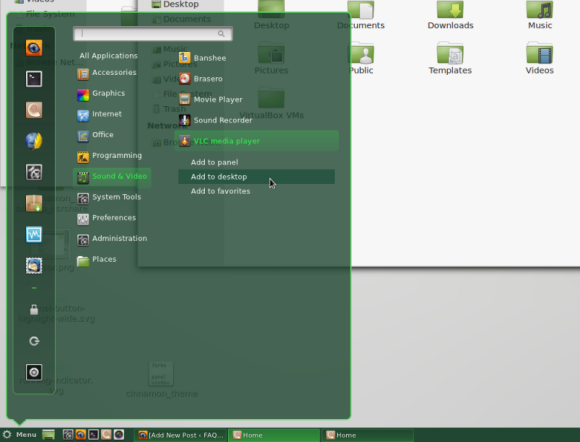 I have recently installed Linux Mint Cinnamon 19 and am a Linux newbee. I NEED to be able to “cascade” open windows, ala Windoze 98 to 7. There is no obvious way to do this and I see no settings for it anywhere. Saw online solutions to use “winkey + c” and “super + c” but this does nothing (or do I have another setting that is blocking it). Alternatively, is there a distro that does have this and other missing settings I am used to from Win XP?